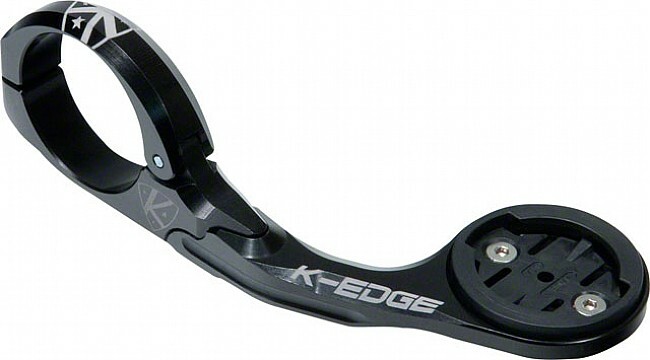 For the rider that wants all the data at their fingertips, K-Edge's 35 mm Garmin XL Mount is designed to fit larger EDGE model computers such as the EDGE 1000, 810, and 800 onto oversize 35 mm diameter handlebars. It will also fit any of the more compact models like 500-series EDGE computers, Forerunner, or Touring computers. CNC-machined 6061 T6 Aluminum construction is lightweight and strong, and a hinged clamp mechanism makes installation easy. K-Edge went through great lengths to ensure their copolymer locking insert would breakaway before the tabs on your computer in case of a crash, and should such an accident occur, replacements are available free-of-charge from K-Edge.